As a non-historian, I come to understand the past fairly late in any cycle of commemoration. My school English teacher wrote a well-regarded book about the Somme and we had a signed copy at home, but I've never read it. Philip Orr is a member of the History Hub Ulster's advisory panel. 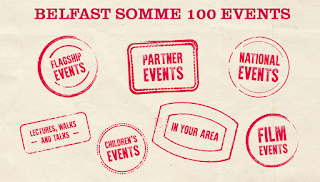 Belfast Somme 100 is their programme of events and projects - funded by Belfast City Council - marking the centenary of the battles of the Somme, exploring the place of the Somme campaign within the First World War and its place within the social and political history of Northern Ireland and pre-partition Ireland. The Cenotaph at Belfast City Hall will be the venue for the annual wreath laying ceremony at 11am on Friday 1 July, remembering the men of the 36th (Ulster) Division and the 16th (Irish) Division who lost their lives. Already there have been concerts, walks and talks. And between now and November, there will be exhibitions, lectures, conferences and films across north, south, east and west Belfast. Keep an eye on the website for details of the kids programme planned for Saturdays in July and August. Between Tuesday 5 to Saturday 16 / Frank McGuinness' play Observe the Sons of Ulster Marching Towards the Somme will be performed in the Lyric Theatre. Between 3 and 14 August, Féile an Phobail will host a series of talks around the Battle of the Somme anniversary. 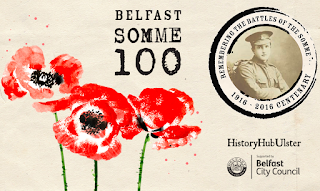 Until 19 December, an exhibition highlighting the contribution of Orangemen at the Battle of the Somme - The Lily and the Poppy - is running in the Museum of Orange Heritage in Schomberg House. This morning, Sixteen South officially opened their new offices in One Clarence Street, the company’s third premises. Chief Executive Colin Williams explained to visitors and press that back in 1884 the building was home to the Clarence Finishing Company, a linen manufacturer. Sixteen South are celebrating being in production of season two of Lily’s Driftwood Bay – a show “proudly born and bred in Belfast”. The new series takes it up to 100 episodes of the show that has been sold to over 100 countries across Europe, Africa, Middle East and America. Another show Claude is also in production for Disney and will be dubbed into 21 languages. And there’s a new pilot for PBS in the works too. The company’s first foray into children’s television came with two series of Sesame Tree [which led to my favourite ever interview] followed up with Big City Park, Pajanimals, and Big and Small. Over the years, the First and deputy First Ministers have attended many launches at Sixteen South. 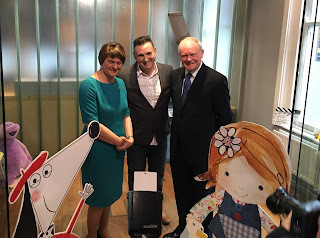 Despite acceding to being photographed with Muppets in the past, the joint leaders of Northern Ireland have always seemed relaxed at these events. The gathered press were keen to capture political views on Brexit this morning before the opening began. The United Kingdom’s withdrawal from the European Union does create uncertainty for the film and animation sector in Northern Ireland. In a few years time they will fall outside quotas for broadcasting EU shows and their product may be a lot less attractive to television channels across Europe. The First Minister Arlene Foster reminded those gathered that she’d “been a huge supporter of the creative industries right throughout my time as Enterprise Minister”. Thanking Colin for the invitation to attend, the deputy First Minister quipped that “some of those hankies would have come in useful last Friday”. Martin McGuinness remembered being at the original launch of Lily’s Driftwood Bay and said the international success was a “tremendous accolade to yourselves and a testimony to the quality of the work”. NI Screen’s Richard Williams reminded those gathered that the Opening Doors Strategy target is to have a screen industry here in NI that within ten years is second only to London in the UK and Ireland. 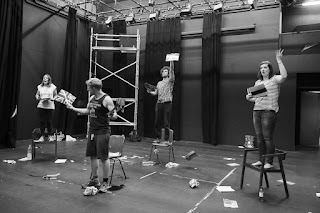 Four actors, a director and a dramaturg walk into an empty theatre. It’s like the start of a joke … or in the case of the cast, Patrick J O’Reilly and Hanna Slättne, a self-imposed five day nightmare. The external instruction they received on Monday would shape the entire week. 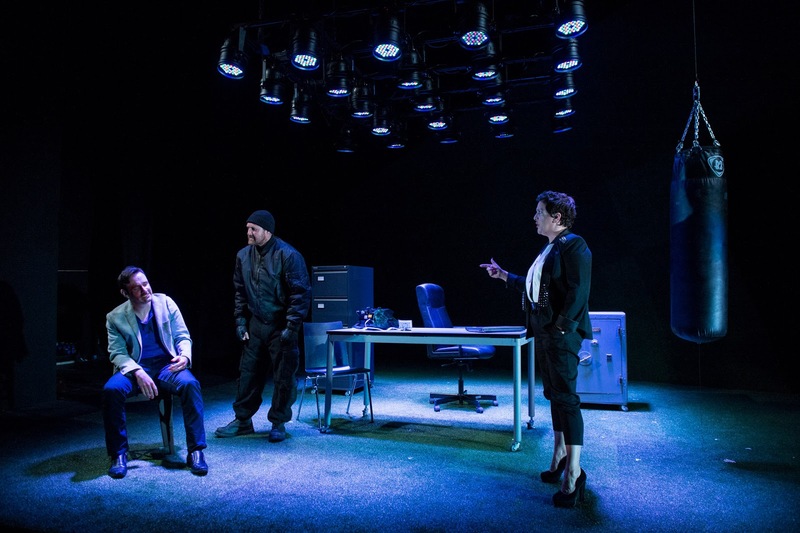 The Friday and Saturday night audiences had no idea what was ahead when they walked into the Upstairs at the MAC theatre for IGNITION. Unless the team had sat in the pub for the last week, between the group exercises and the perspiration accompanying the ever-closer deadline, they must have dreamt up something? What happened next was reminiscent of some of the shows in the Old Museum Arts Centre. 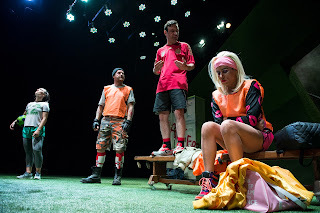 There was gentle audience participation as we took our seats, joining in the cast’s new ball game (a cross between a net-less-volleyball-badminton-baseball variant). Later the show paused for a moment of reflection and we helped servce refreshments. The main show – which can’t really be distinguished from the moments of breaking the fourth wall – is a metadrama, increasingly self aware of the pressure under which it was created. Flipcharts and post it notes cover many of the walls around the stage. There’s an air of incompleteness and unanswered questions that drives the performance forward. Snippets of contemporary news from a local newspaper propagate belly laughs in what becomes a roller coaster of emotion. Panic is stirred up by kill joy Keith Singleton. Louise Matthews and Michael Patrick are joined on stage by Julie Maxwell who doesn’t escape a shower of water (though less immersive than her previous role in the Upstairs theatre!) while her eyes have a lethal glare. There’s even room for some multi-lingual tongue twisting around the fear-ridden referendum. IGNITION is a promising format. A sustained burst of creativity tested out on an audience before complacency and script rot can set in. A different cast and we’d have a totally discrete show. A different line of inspiration and we’d have been transported to a totally new destination. Nerve-racking for the company, pretty nerve-racking for the audience too. Not a bad way to light up an evening. 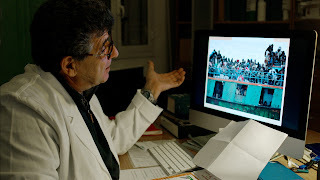 Fire at Sea is a powerful if unusually crafted documentary based around the island of Lampedusa, about 200km away from Sicily. The local fishing boats that set sail from the harbours are no longer the only vessels in the sea. Refugees pay to make the perilous journey from Libya across to Italy in boats packed with bodies. Standard fare sees you crammed into the dark hold, risking burns from the diesel fuel and death from the heat and dehydration. Pay double and you can perch on the deck. 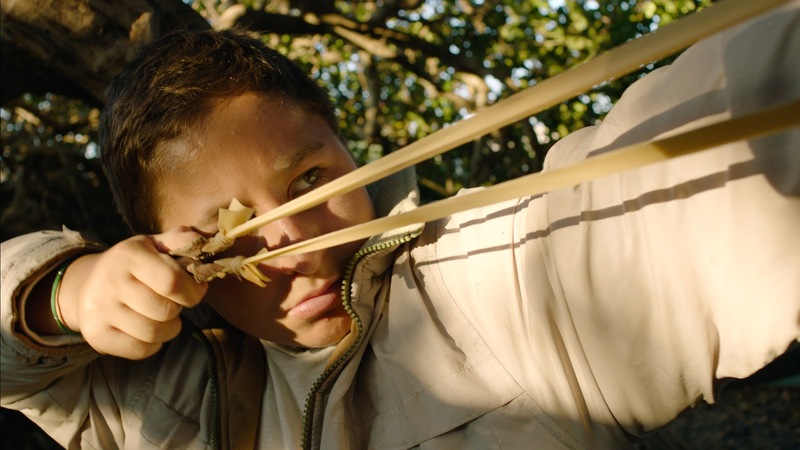 The film follows three generations of a fishing family, often watching the play of young Samuele whose war games involve his slingshot and pretending to shoot with his pump action finger. We hear the ship to shore radio communication between a boat in peril and the Lampedusa Coastguard station, and watch as naval vessels launch a helicopter search mission and sailors equip a boat’s passengers with life jackets before evacuating the most severely dehydrated, the walking wounded, and finally the dead bodies. Running just shy of two hours in length – though unlike The Revenant, the time passed quickly – the narration-less documentary with its sparse dialogue patiently lingers over each scene, allowing the audience to spot moments of visual and thematic symmetry between the different strands of the film. Months spent safely out on the water fishing is contrasted with the treacherous flights to escape. An ultrasound scan looks eerily like the Coastguard sonar display. The new life represented by the intertwined twins huddled together in the dark in their amniotic fluid contrasted with the refugees clinging to each other in the dark hold of the smuggler’s boat. The treatment of Samuele’s lazy eye: a reminder of need to correct the tunnel vision of many in society who would prefer not to do anything about the 60 million or more displaced people across the world. People’s eyes speak out about fear, relief and uncertainty about the future. Official photographs taken with ID numbers but without the dignity of a name, and often with the country of origin guessed by a slow process of elimination. 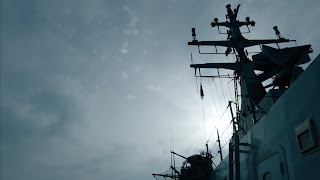 There are no shortage of poignant moments in Fire at Sea, but perhaps the most soul destroying is the instant a rescued woman sitting on the deck of a naval vessel asks in desperation “Are all the black men on board?” before breaking down in tears. While a few domestic scenes look less than naturalistic, the post production on Gianfranco Rosi’s film is very subtle and it’s hard to believe that a colourist was employed. Fire at Sea is difficult to watch. It gently captures the human tragedy that sails towards Lampedusa on a weekly basis and personalises the staggering numbers of deaths. In the first five and a half months of this year 2,438 people have been reported dead or missing on sea crossings to Italy, and another 376 on their way to Greece. Refugee Week runs from 20-26 June. 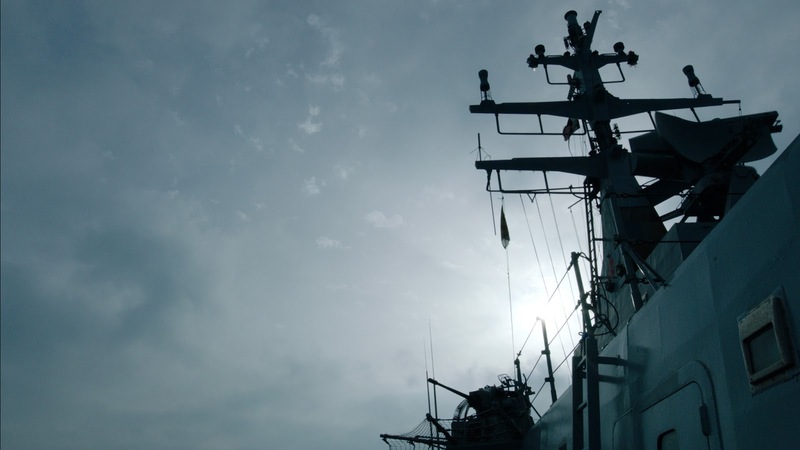 You can catch a screening of Fire at Sea in the Queen’s Film Theatre until Wednesday 22 June. Smiley has a plan to pay back his debts which involves entering a team of less-than-amateur ringers in a local football tournament with a big prize fund. But when an ex-paramilitary god-mother intervenes, his odds of success change. 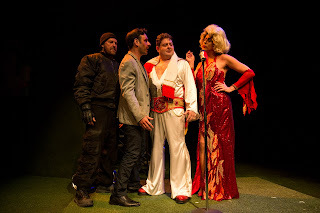 Throw in a very credible Elvis impersonator, a drag-queen and a complicated set of interpersonal relationships, and you have a comedy tinged with peril. Gary Mitchell’s new play Smiley looks at a society in transition where not everything is going forward. Characters bring their past lives with them into the locker room of life as they confront new problems with their old skills. The Northern Ireland allegory is kept very much in the background, so much so that for many this may only be seen as a funny heist about football. 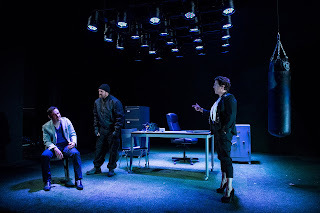 For a stage play, Smiley has an incredible number of set changes with bulky furniture keeping the stage hands busy as the plot's overly complex twists and turns are revealed. It’s probably closer to a film script that theatre. While this shows off Liam Doona’s artificial grass set and John Comiskey’s suspended lighting array, it adds a lot of injury time to the first half. Smiley is at its strongest at the beginning of the second half, with the plot, dialogue and directing sprinting together up the wing with an assured pace that makes up for the lateness of the evening. While the story revolves around Michael Condron’s shouty titular role, James Doran has the most rounded character to play with. Director Conall Morrison paints Malcolm as a menacing minder, but has the audience aahing in sympathy in a moment of vulnerable revelation before the vicious dénouement. 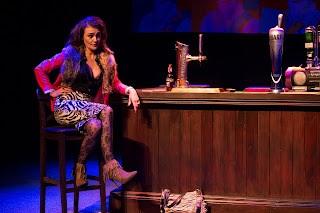 Jo Donnelly revels in being monstrous, though her intimidation fails to work on Smiley’s ex-wife Elaine (played by Kerri Quinn) who temporarily reduces her threat level. Gavin Peden brings to life Smiley’s son, a consistently weedy and androgynous lad with more imagination than talent. Sub plots and themes litter the script. An exploration of homophobia is responsible for a sustained string of sexual innuendo that generates cheap laughs. 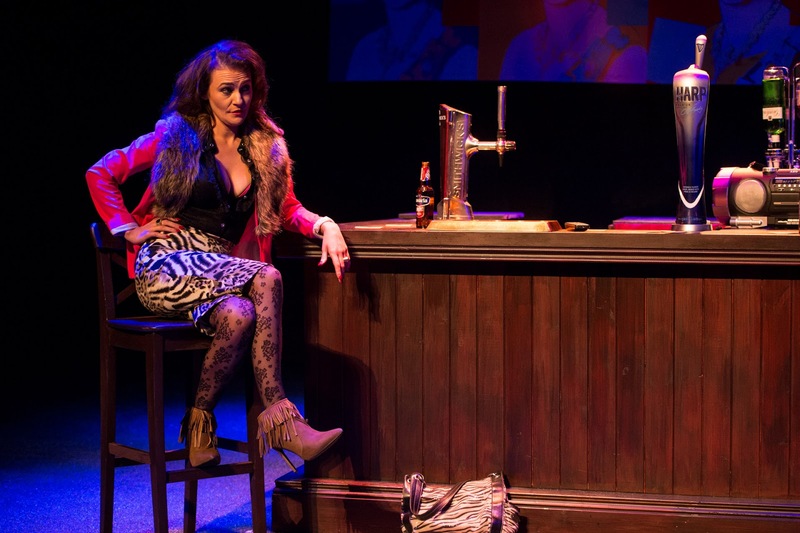 Ten years ago the play would most likely have featured fewer female roles: it’s a shame that the only way found to portray a woman as being confident was the use of a push-up bra and cleavage that should really apply for its own Equity Card. 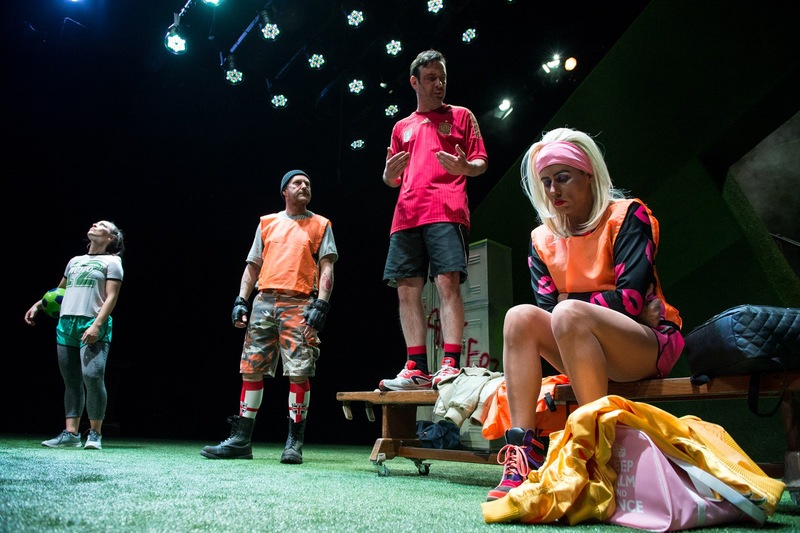 The gender bending is completed by Charlie (Roisin Gallagher), a successful woman footballer who is crowded out of the script by the more thuggish elements of the story. While the stadium-like set looms darkly over the cast, at times the staging was nearly too ambitions. The clever rain effect on the bus shelter wasn’t echoed by the characters elsewhere on the stage. A phone rang on stage but the sound came from behind the audience. And the final spotlighted shadows failed to deliver the intended crisp shapes being thrown by Aaron/Elvis and Cameron (Tommy Wallace). Small niggles that may disappear during the run. Smiley’s fast-paced humour has the audience in the stands guffawing throughout two halves. The final minutes of the play show off Gerard McCabe’s great voice in a scene reminiscent of Dennis Potter‘s love of throwing tunes at a show and allow the play to wrap up its loose ends and go out on a high. 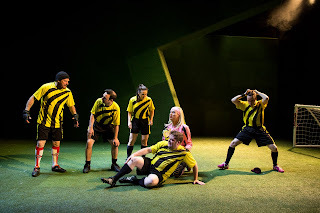 With football in the air you can catch Smiley at the Lyric Theatre until 2 July. It’s fairly likely the local teams playing in Euro 2016 will be home in time to catch a performance before Smiley’s run finishes! IGNITION is a new project by the rejuvenated team at Tinderbox Theatre Company. Starting on Monday morning, four performers will be locked in a rehearsal space with artistic director Patrick J O’Reilly and dramaturg Hanna Slättne to devise a new work that will be performed on Friday and Saturday evening in The MAC. Alongside the rapid turnaround innovating, a one day State of the Arts dramaturgically led workshop will be held on Saturday. 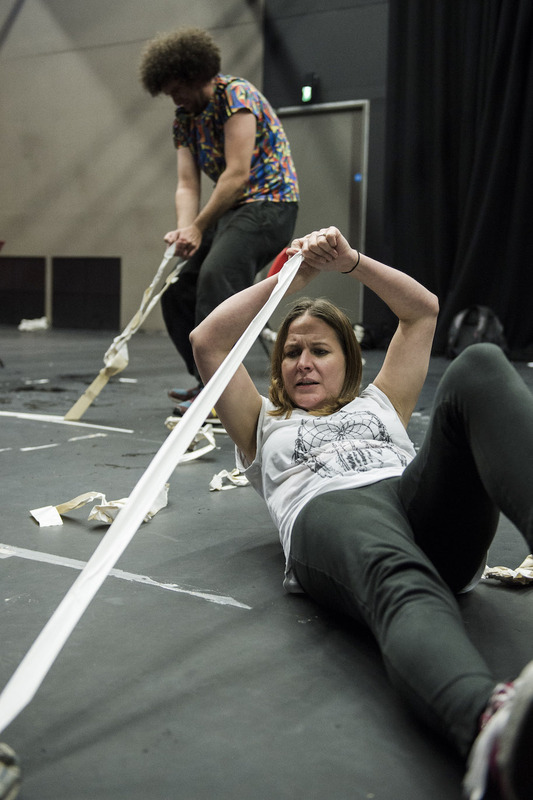 Ten other theatre makers will attend and be assisted in the development of their new ideas. Tinderbox hope to run IGNITION twice a year in order to work “the wealth of talent we have here” in Northern Ireland. Over time they’ll use different performers, different styles and even vary the writers-to-performers ratio in the rehearsal room. “We hope to find gems of idea that we want to develop with writers and make into larger pieces of work” says O’Reilly who has just finished touring Britain and Ireland with Big Telly’s madcap production of Spike Milligan’s Puckoon. Time bound by one week, there’s isn’t scope for big sets and complicated productions. But that doesn’t put O’Reilly off: “for me simplicity is the key”. He believes that stopping to perform or read a new work opens it up to discussion and fresh ideas, before picking it up for further development. Book a ticket and head along to The MAC at the end of next week and see what Louise Matthews, Michael Patrick, Keith Singleton and Julie Maxwell have come up with. As well as IGNITION, Tinderbox are planning a triptych of pieces – What We Are Made Of – to be performed in the autumn. Three forty minute shows will highlight new writing and new devising processes. They’ll be performed together over a two week season but will also tour on their own, with at least two hitting international circuits.